Art school is way too expensive. Putting yourself in debt is a really good way to force yourself to get a day job … and never paint again. If American advertising embraced the hyperreality of a sick and twisted Norman Rockwell, it would look like Peter Adamyan’s work. Peter’s layered woodcut paintings poke fun at the dark and grotesque qualities of American consumerist culture, emphasizing the hedonistic and pornographic aspects of our daily force-fed media consumption. In these collage-style pieces, Peter references pop culture, film and television, religion, politics, war, social issues, and world history in his satirical commentary, repositioning famous figures and icons in the roles of brand and movie characters. In “Explosions Of Flavor”, Kim Jong Il proudly looks on as a nuclear bomb goes off in the background. It’s an ad for a fictional nuke-flavored “Jong Ramen” product, with a Super Mario Bob-omb as its mascot. In another painting, Osama bin Laden takes the place of the villain Jafar from Disney’s Aladdin while Aladdin, wearing a suicide bomb vest made of cartoon dynamite, rides the magic carpet with a fully burka-clad Jasmine. One of his biggest pieces, “Painting to a Christian Nation (God Bless This Mess),” is a chaotic monstrosity of religious, political and corporate symbolism. Peter’s work may be offensive, but he’s aiming for laughs. He merely assembles concepts for his paintings according to what he thinks is the funniest and pulls inspiration from all over, asserting that his art is an accumulation of everything he likes and hates at the same time. I want to do what every artist wants to do and just make good work. 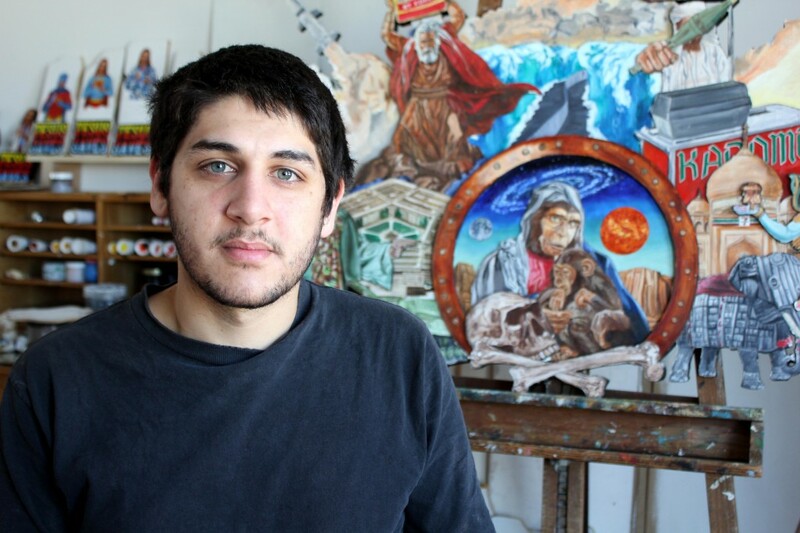 Like many artists, the 25-year-old oil painter has been making art his whole life. He’s been showing his work in galleries around the U.S. regularly for the past 6 years, has curated a show at the monthly Oakland Art Murmur, and is currently showing pieces in Los Angeles and the San Francisco Bay Area. Peter didn’t go to art school, but he was awarded a three-course art scholarship in high school that introduced him to formal training in painting. He says because public high school art classes don’t offer high enough quality skill development, the scholarship program was a big help in putting him in the right direction. When the scholarship ended, Peter continued to study art independently. The Oakland-based artist suggests learning from books, free online tutorials, workshops, and simply putting your craft into practice. His first taste of art education came from a TV show he watched as a kid, Secret City with Commander Mark, which taught children how to draw step by step. “My brother and I used to watch it all the time,” he says. Peter’s older brother was also a big artistic influence. “When I was 7 and my brother was 10, he made a chart of all the different kinds of eyes, all the different kinds of noses — [details] all the way down to the belt — and I would mix and match them.” Peter pauses before regretfully adding, “Now he’s an economist.” But even though his brother has abandoned art as a career for himself (as many artists do), he’s still Peter’s biggest supporter. 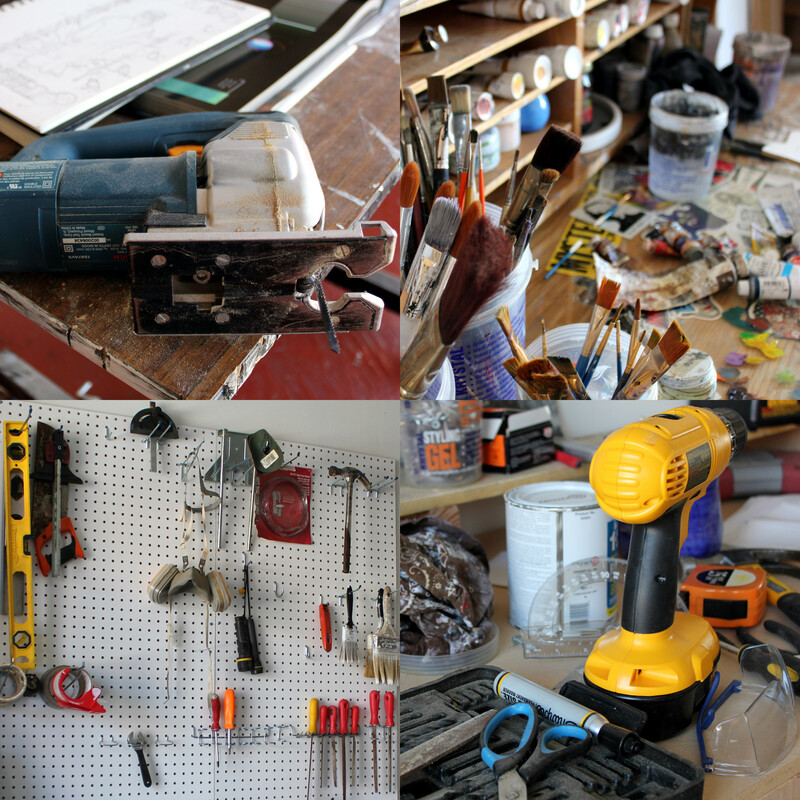 In his humble beginnings, Peter used found objects and trash in his pieces, aiming to make art out of whatever was lying around. He started out experimenting with different materials — found wood being the most prominent — and eventually landed on the style he uses today. “Now I buy all the stuff,” Peter says. From conception to finish, a single piece could take Peter either weeks or months to complete, depending on whatever else is going on in his life. Factoring in his day job, how many gallery shows he’s in and how big the pieces are, he can work on two to several pieces at once. All of Peter’s wood projects are carefully mapped out on paper first. “I try to fit in as many little details as I can; little funny mashups,” he says. Starting from the top layer down, he sketches out each component of the project onto separate pieces of wood, does an underpainting and then saws the edges out by hand with a jigsaw. Then he files and sands the edges smooth, paints them black, and glues the piece down onto the next layer. He cuts where one layer meets the next so the outer edges are flush against each other, establishing a uniform outline. Peter repeats this process until reaching the base layer, which is usually the thickest piece of the whole project. And after all the cutting is done, he finishes painting the entire piece as a whole. People don’t realize that artists need to be supported. If you want to see better work from them or more work in general, you should support them. As for his plans for the future, “Eventually I want to illustrate the whole Bible,” he says. “And keep showing and make better work … I mean, I wouldn’t mind being the Richard Dawkins or the Sam Harris of painting, but… probably not gonna happen.” Well, we’ll see about that. To see more of Peter Adamyan’s work, visit his website at peteradamyan.com. You can also check him out on Facebook and follow him on Tumblr.